The Avnei Nezer also known as the Sochachover Rebbe,married the Kotzker older twin daugher, Sarah Tzinah, in 1853+-. The Avneir Nazar at the time of ths story was maybe 18 years old. This story took place during the years of the Kotzker’s “Hisbotidus” – years that the Kotzker limited his contact with the world. 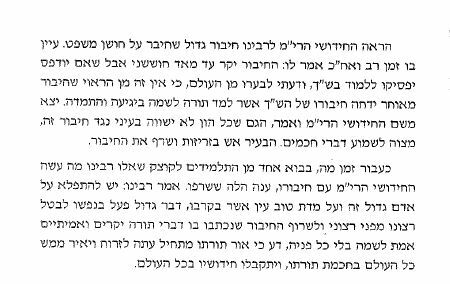 The Avnei Nezer, son-in-law of the Kotzker told the following story. I worked hard on a Ramban and after much effort God enlightened for me the answer. (The quesion at hand was a difficult Rambam who seemed to rule on a specific law in contradiction to the Talmud.) The Rambam in question had a different version of the Talmud and therefore his ruling was proper. I told my Torah original thought to the Kotzker and he did not say anyting. The Kotzker told me to return to the study hall and say the Torah thought to a scholar you meet in the study hall, and report back to me. I found the Chidushai Harim. The Chidushai Harim did not agree with my Torah and felt that the Rambam was still difficult. I reported back to the Kotzker, who again told me to return to the study hall to speak with another Torah scholar. I found Reb Henoch M’Alexander, who greatly appreciated and agreed with my Torah. I returned to the Kotzker who called in the Chedushai Harim and Reb Henoch M’Alexander. The three of us stood before the Kotzker, who scolded us and said, is this the way you learn the holy Torah, with uncertainty, This one says it is difficult and the other says it is correct. The Kotzker proceeded to explain the Rambam and answered it 13 different ways. The Aveni Nezer said, I only understood 6 or 7 of the answers, the Chidushai Harim understood up to 10, and the remaining answers we did not understand due to their depth and sharpness. The Chidushai Harim showed the Kotzker Rebbe a manuscript on Torah he wrote on the Choshen Mishpat, (the portion of Jewish law that deals with civil law). 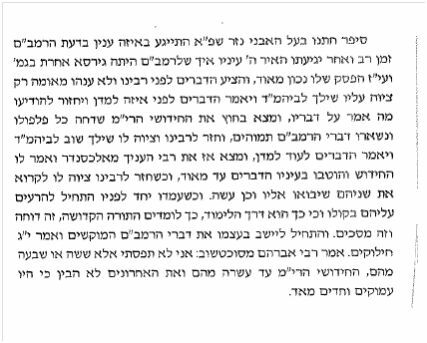 The Kotzker looked at it for a long time and afterwards said – This manuscript is very special, however, I am afraid that if you publish it, people will stop learning the Shach (a major commentary printed along the side of the Choshen Mishpat text). The Shach learned Torah for its own sake with major effort and diligence. The Chedushai Harim left the Kotzker presence and said, even though my manuscript is invaluable, it is a commandment to listen to the words of Torah scholars. The Chedushai Harim started a fire and burnt his manuscript. A while later a student came to the Kotzker and the Rebbe asked the student, what did the Rim do with the manuscript. The student answered that the Chedushai Harim burnt it. The Kotzker Rebbe commented – how wondrous is this great person and the generosity of his sprit, he did a great thing to sublimate his will before mine, and burnt his manuscript that contained precious and true Torah. Know that the light of his Torah will begin to shine. The wisdom of his Torah will enlighten the entire world, and his Torah thoughts will be accepted worldwide.